Black Wooden Dress Hanger - 17"
If you're looking to upgrade your store's hangers to something more sturdy and reliable, then these 17" Black Wooden Dress Hangers are a perfect solution. A dashing addition to your collection of elemental store supplies, dress hangers are our most popular style hangers, and a must-have for retailers creating merchandise displays. The chic black finish of this 17" dress hanger flatters any garment and highlights the colors in a complimenting fashion. The silver metal hook provides extra strength and durability on these all purpose wholesale wooden hangers. Sold in cases of 50. I love the way the hanger looks. Lovely slick look. Makes the clothes look classy. I wanted a classy, high end look to my boutique so I went with these black wooden hangers. They look great with the ivory racks I purchased, and they display the clothing well. The hangers tie in the complete chic look I was going for. The price is great and I got them the very next day! I will be reordering these in the future! I browsed online and this site was by far the cheapest. I ordered the black hangers and they are very sleek looking, i love them. I placed my order on a Wednesday evening and had them Friday. Super fast shipping. These hangers are great! They are very well constructed and clothes stay in place on the hanger, do not fall off! We bought these for our new store location and they look so good we are considering changing out to these in our original store. 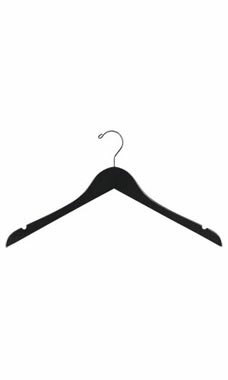 I use the wooden hangers for my clothing boutique and the quality of the hangers make the clothes look more expensive. Love them! Perfect for my men's boutique. The elegance of wood and paint holds up. Functional hangers for 90% of the apparel in the boutique - don't use for slippery fabrics.